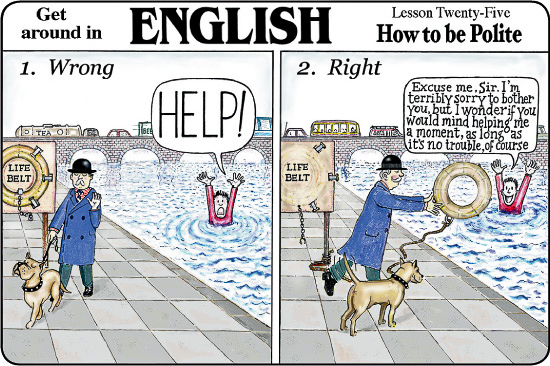 Overwhelming Politesse: Does English Tread More Softly Than Other Languages? Modern English is threaded through with all manner of polite turns of phrase, evasive maneuvers, and superfluous tautologies. We do not ask a question; we ask if we may ask a question. We say “I’m sorry” when someone tells us that he has been sick, as if we had a hand in orchestrating the flurry of microbes that wreaked havoc on his body. And we ask to be excused as a preface to myriad statements that discomfort and inconvenience neither the speaker nor the listener. Politeness seems to be a built-in component of the English language and a familiar and comfortable trope for most Americans and Brits. This fact becomes readily apparent when traveling abroad, for most countries and most languages do not tread as softly. I am currently living in Russia, a country not particularly renowned for its timidness of speech and thought, and find myself playing the timid, overly-polite American on a regular basis. In restaurants, for example, it is not customary to address the server with a tremulous “excuse me” before requesting something. Russians yell out “девушка” (young woman), “молодой человек” (young man), or “женщина” (simply, woman) to catch the madly-scurrying server’s attention. In buses, passengers hand their change over to the driver with the word “берите” (“Take it” as opposed to our “Here you go”). In the latter example, the Russian phraseology may ruffle Anglophone feathers because it puts the onus of responsibility on the person providing the service rather than the one requesting it. While the end result is the same, modern English demands that we skirt around brute, bare facts with the pleasantries of circuitous wording. The psychological aspect of polite versus direct language is perhaps even more interesting than the linguistic one. While it may be difficult to disentangle the history of language and general behavior as it pertains to a nation, it is easy to see the link between the two. Modern Russian’s relative absence of pleasant, but ultimately unnecessary euphemisms, is reflected in modern Russians’ direct, no-holds-barred approach to dealing with people and situations. Modern English’s abundance of such phrases speaks to our desire to please and comfort and create an amicable atmosphere. The people that stand behind both forms of communication are similar in their desires, intentions, dreams, and aspirations, but their approaches are modeled on the current climate of their countries and their languages. Thanks for this eye opening post, Marie! Being English, I completely understand the concept of skirting around the crux of a negative conversation or apologising that you have no control over. I dread to think the reaction most of the English population would have if they were faced with the Russian way of approaching a conversation. Hello Marie, I want to congratulate you for this interesting article! I think that you have very interesting point of view , but I think that the majority of the languages have their own manner of polite turns of phrases. It’s just that every individual has to choose between being polite or not. On a serious note, politeness is a subjective matter that is defined by culture. This certainly highlights the importance of localization.